Recently, a client reached out to me-let’s call her Jennifer—in obvious distress over her unattended but vastly accumulating pile of mail, papers and files. She had been dreading the task of sorting all these papers, but a recent incident where her car was impounded because she failed to open and pay her automobile excise tax bill prompted her to get in touch with me. We began working together on a chilly Saturday morning. We went through my usual prep before the sorting, purging and filing: setting up recycling bags, shredding bags and an action/to-do filing system. Of course, I also had my trusty letter opener since we had to open up piles of mail. Then we dove in. We wound up working for 4 hours with a quick lunch break. Even though it was tedious work at times, we swapped stories and had a few laughs together. And then the heaping pile on her dining room table was gone. 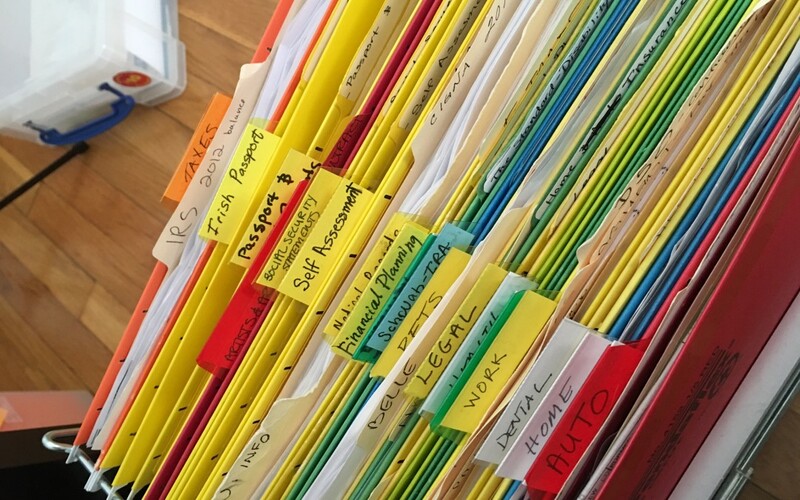 Although Jennifer had originally dreaded this organizing task, she found that working with a professional organizer was really helpful in deciding which papers to keep and which ones to toss. And having company just made it more bearable, period. There was a bonus too: We found 4 gift cards, an un-cashed check, vet bills that could be submitted for reimbursement and some money!! We decided to call it a day and I was impressed with her quick decision-making, her willingness to complete the task and her ability to laugh at some of her discoveries. She decided to schedule a second session. During the follow-up session, we pulled out bins and bags of really old tax documents and out-of-date records. We purged many papers and set up the filing bins to hold relevant archived documents: tax records going back 7 years, previous design projects and other necessary papers. When we were finished we had several neat filing bins with the archived documents and a neat filing system in desk drawer, which she was instructed to purge at the end of the year. Jennifer. She felt so much lighter and had greater peace of mind. Plus her dining room table now looked beautiful. Full disclosure: I did some paper purging myself today before I began writing this case study. I spent some time tossing many health articles that I had kept from when I was a wellness coach. I haven’t had the need for them in several years. I decided to my heed my own advice: keep only those items that are a reflection of who you are today. And today, I am an expert organizing coach. And I’m available to work with you on your organizing project.